“Campaigners for a gay history museum in London have placed pink filing cabinets across the city to raise awareness. There are a number of permanent exhibitions of gay art and history in other major cities, including the Leslie Lohman Museum of Gay and Lesbian Art in New York, and the Schwules Museum in Berlin. But London doesn’t have a space dedicated to lesbian, gay, bisexual and transgender (LGBT) history. 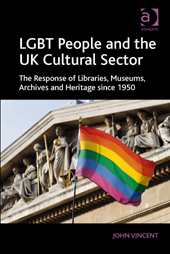 The move for a museum is deemed necessary because despite the huge role that LGBT people have played in the history of London and the UK their stories have often been marginalised. The pink filing cabinets aim to symbolise the millions of stories involving LGBT Londoners that sit hidden in museum archives. Campaigners want these archival documents to be unearthed and form the base of a museum, which would chronicle London’s battle for equality. As a woman who was outed in the local press in August 1998 and has subsequently spent 20 years in ” the wasteland” of Margate waiting for a backlash on KCC’s Clause 28 policy, I welcome all campaigns to raise awareness of Past prejudice & discrimination against LGBT community.